Earlier this week, I was asked to refurbish and appraise some items of jewellery. Two items were Antique pieces of jewellery, set with Old Cut diamonds. We thought it would be interesting to show these, and to talk a little about some of the characteristics of older diamond cuts, and how to identify them. 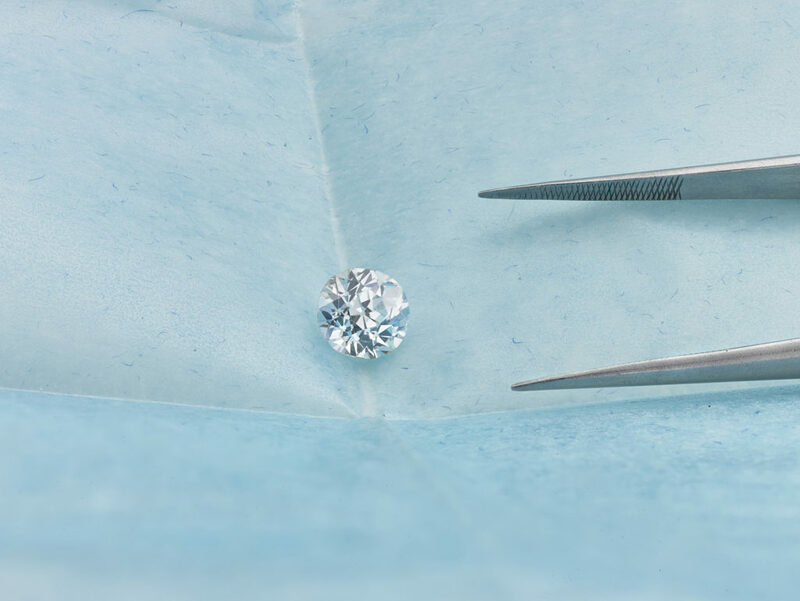 Buying old cut diamonds can be tricky since most stones are re-cycled from older pieces of jewellery. Large, high clarity diamonds often end up being re-cut into modern brilliant cuts to achieve higher prices. As a result there is a certain scarcity for buying old cut diamonds, especially in larger stone sizes. Distinctively deep, with small table facets, old cut diamonds are less uniform in cut. If you have done any research into antique jewellery, or older styles of diamond, it is more than possible you have encountered the reference to ‘Old Cut’ diamonds. Today most round brilliant cut diamonds are uniformly faceted, and more accurately proportioned, despite differences in the quality of the proportions and cut. 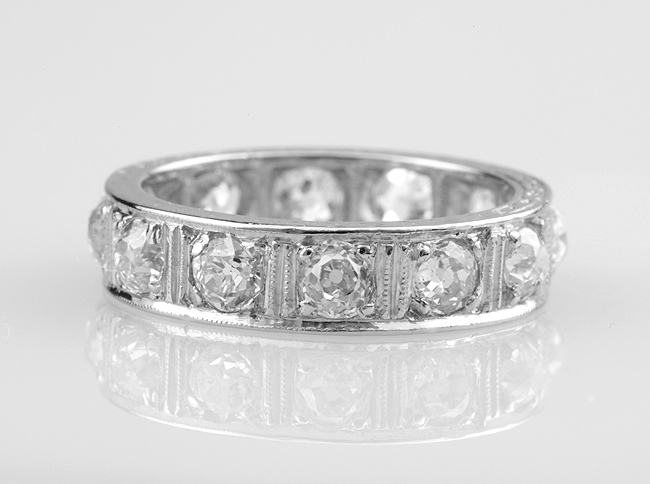 Older cut diamonds are regularly bought and sold across the World, but many originate from antique pieces of jewellery. Many are purchased at auction, or scrapped, leading to the recovery of loose older cut diamonds for sale or re-setting into new mounts. Modern ‘Old Cut’ diamonds are still produced today, but the overall proportions and finish are different from the less uniform appearance of older stones. 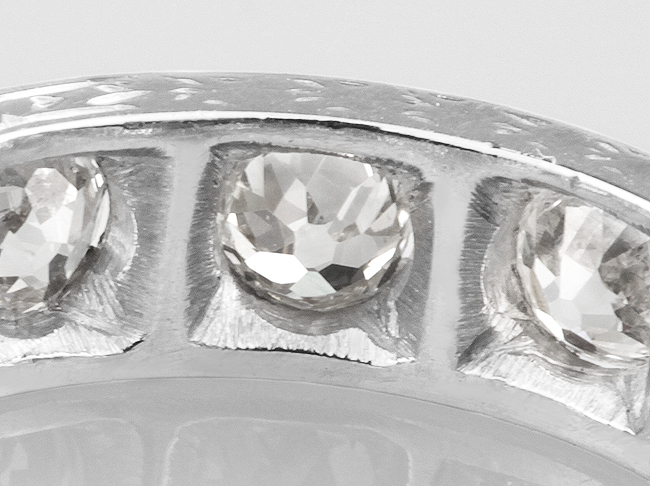 Deeply cut proportions – diamonds appear thicker than modern round brilliants. Small table – the upper facet is higher and quite small. Polished culet – The bottom facet of the underside (Pavilion) known as the culet is polished flat. 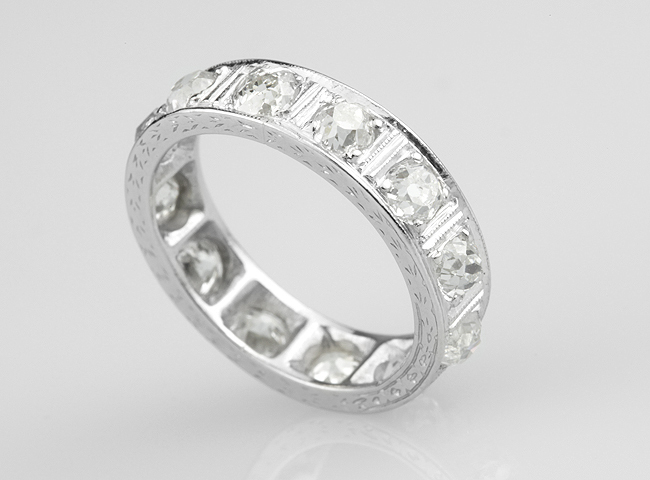 If you look at the image below, you will see the flat polished culet on the underside of the diamonds. From the opposite side (the table) you will see this as a small circle, viewed from the top of the diamond. Buying Old Cut Diamonds – Sourcing antique stones. Contact us if you would like to purchase an Old Cut Diamond. Examples such as the diamond below were sourced for clients using our diamond concierge service with high resolution photography available. 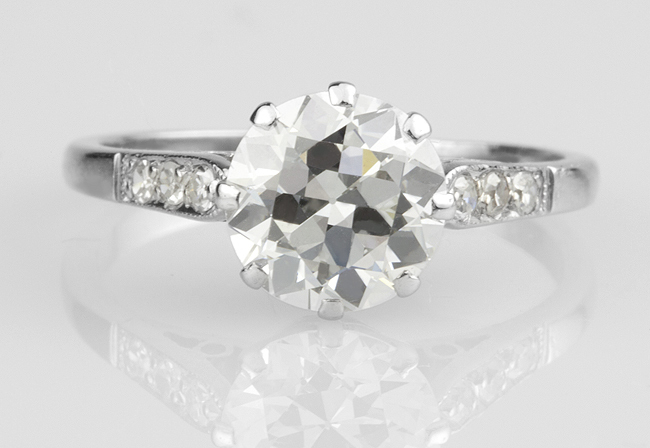 From time to time, we re-model Old cut diamond rings. Working with a client’s own diamonds, we craft new ring styles, using old diamonds. The following example shows small old-cuts with high table facets, surrounding a large oval opal. There are many possibilities for Old Cut diamonds, especially larger diamonds above 1 carat in weight. Many traders will send these diamonds for re-cutting, into modern brilliant cut diamonds. This is often done because it improves the proportions, how the diamond handles light, and increases the value of the stone. The diamond below shows a nicely proportioned Old European Cut, with a small polished culet, and fairly shallow proportions. 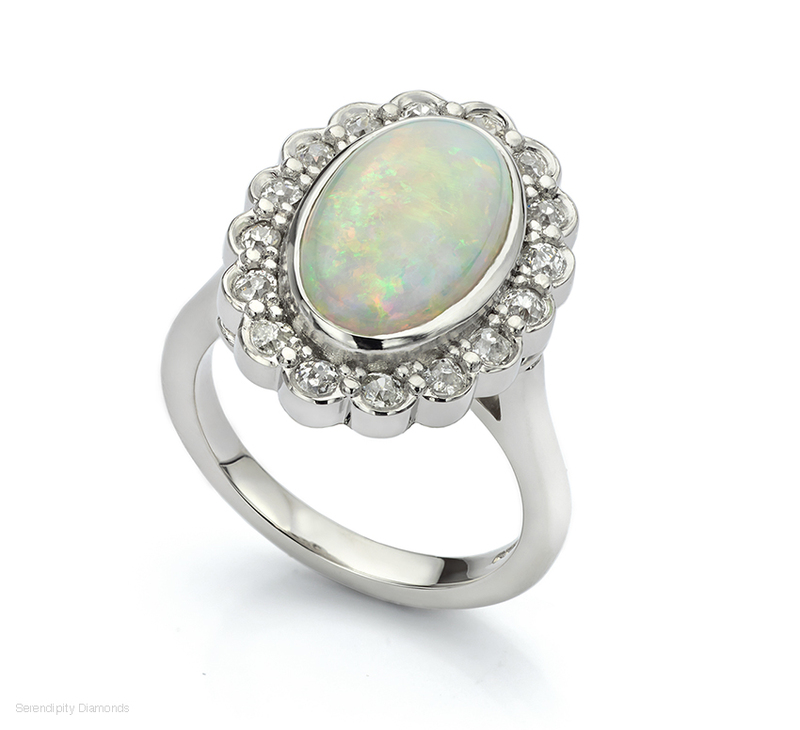 The stone is just under 2 carats in weight and measures 7.5mm in diameter. 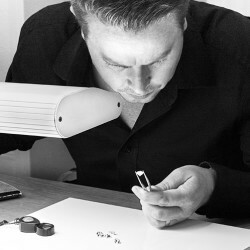 Owing to the provenance and unusual faceting, owners will very often find the true value in the unique appearance of any particular diamond. Old European Cut – Nicely proportioned with a smaller polished Culet, this Old Cut diamond could potentially be re-cut into a modern brilliant cut diamond. There are many other cuts of diamond which could be labelled as older cuts. Many of the diamond cuts give evidence of how the cutting process developed. One of the other styles, encountered in antique pieces of jewellery is the Rose Cut. This type of diamond cut is worth a mention here, since it does crop up from time to time. The Rose Cut can be single or double (flat on one side or faceted on both sides.) Some smaller examples are more like diamond chips, with little detail. Beautiful examples of larger Rose Cut diamonds can be found. Many provide very large spreads owing to the shallow cut producing larger than typical proportions. Such diamonds allow most of the light to pass through the stone, without the same brilliance, and refraction from modern diamond cuts. Further reading – Wikipedia has some interesting and useful information on Diamond Cuts, including a paragraph on their history.